Back when telephone cards were being used nationwide across the UK (1981 to 2003), British Telecom (BT) used to install green bins (pictured right) beneath the cardphone within the telephone kiosk. 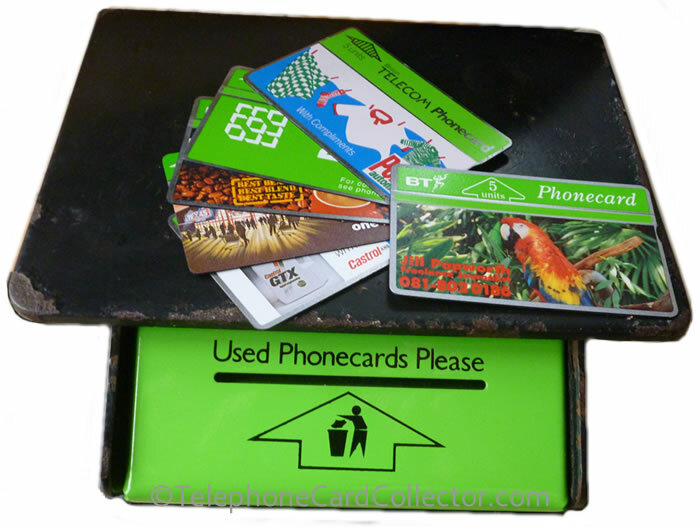 These bins were provided so that when a BT phonecards units or credit had all been used, the user could simply dispose of the used phone cards responsibly. Of course for collectors these bins were a potential 'goldmine' of new, different and possibly very rare cards to add to their collection. 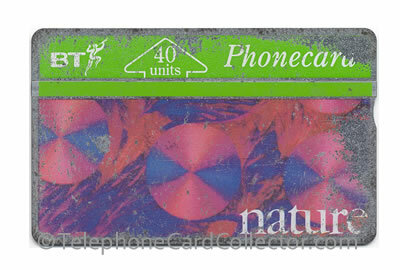 Pictured above - a used and badly scratched Nature / MacMillian Magazines BT Phonecard (BTA038). Lots of telephone cards found in BT's green bins were in the same poor condition. Did you find a rare card? Please contact me and let me know, so I can add your story and find to this page. "WHEN you make a phone call from a public call box you either use cash or a Phonecard. If you use cash, you never see it again. If you use a Phonecard, it keeps coming back until the thing has used up all its magical magnetic powers and is then a dead card. Then you put it (if you are a tidy citizen) into the disposal point provided, marked 'For your used cards, please'... The message on the disposal point 'For your used cards, please'. It should read, 'Keep your old cards, for God's sake, and one day you'll be able to auction them at Sotheby's . . ." Read Mikes article. 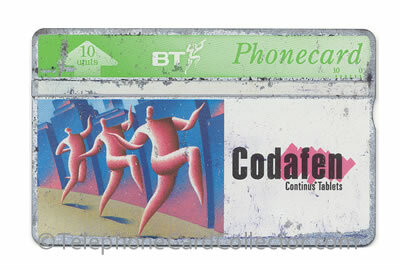 Pictured above - a used and marked Codafen BT Phonecard (BTM019). In the early days of collecting (late 1980s) I've heard stories of these bins being completely full to the brim of used phonecards. With many cards being broken just opening the bin up! "Having roamed various parts of London, literally "walking the streets" for years, I amassed thousands of cards, many of which (particularly the 200unit cards) still had units on them, and it was a waste not to use them. So, in about 1990, I contacted BT and arranged for one of their payphone machines to be installed in the downstairs passage of my house. This eminently was practical, as I had thousands of units by then, and if you actually used so many thousand units per quarter, you covered the full hire fee of the payphone AND BT then paid you (by cheque) for any extra units used. At the end of 1995 (when I asked BT to remove the machine because they were changing over to chipcards) I was actually being paid over £200 per quarter." "My collecting started as my dad worked for the Post Office and worked at Gatwick airport in the early 90's which was a great place to find cards. From the start I had a keen eye for finding cards on the shelves and then we made a contraption which we called "the sticks" to open the green bins. My dad at this time mid 90's travelled the country working for the Post Office, he used to stop off at every green bin he found and bring home the contents. We used to go out for the day driving round our local area finding what we could." "I have a few good finds in the bins. I once had two green bins in a row. We had previously been unable to open them due to being mangled prongs in the back situated in Croydon on the side of the road on double red lines my dad stopped let me out and I couldn't get it open so he put hazards on and spent 15 minutes trying, eventually it went and out came 200ish cards from one and a good 150 from the other. Nothing great in there but a good hoard." "The best card found has to be a mint BTI037 NHS trust card it was in a green bin that was in a box that was a chip only slot. So I guess some one had it in their wallet for a fair while then needed to use but of course could not in a chip slot so disposed it!" 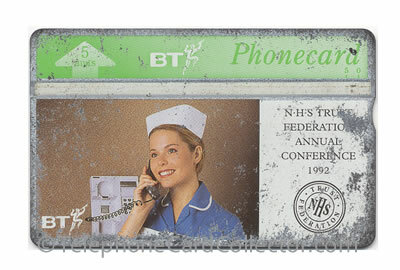 Pictured above - a fully used and scratched 5unit NHS Trust Conference BT Phonecard (BTI037). 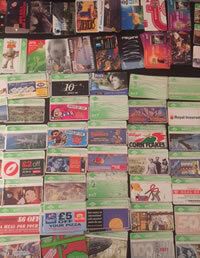 "Another good find was a fellow collector found a large number of Gains International £1 chip cards in a green bin. He wrote into the magazine back in the day and I lived near by and went down to the box and found 10 or so inside!" Pictured right - open-aired British Telecom Phonecard kiosk complete with optical cardphone and a green "Used Phonecards Please" bin. "I was just pottering about my room and came across a collection of phonecards (pictured left - click to see enlarged view) which I often forget about and remind myself of sporadically over the years. It's a thing I no longer collect but fondly remember." "We used to live in Stranraer right across from the ferry terminals for the Stena Line for Belfast (I think!) So it was all the people either heading over to a mini voyage of the seas or returning and would use the phone boxes directly across from our house. I don't know how I started, but did! I would see what was sitting free daily after school and would often watch for the vacant telephone box after the caller would hang up to see if anything was left but then acquired a knife and some jiggling to open the box and low and behold see what "treasure" was left. I have loads and can't bare to part with them just yet but I think of them as a cool thing to have collected. I'll need to get on my laptop to view the collection you have properly! Glad to see a site for it." Read more stories about collecting BT Phonecards via the green bins. As the first collector above writes, an alarming number of phonecards that were thrown away as used, did in actual fact still have units/credit on them - some as much as 50% ormore! This was partly down to the fact that a 200 unit phonecard had two tracks both containing 100 units each. To use all 200 units the user needed to insert the card one way round and then insert the card the opposite way to use the full 200 units. Clearly many of BT's customers didn't realise this. 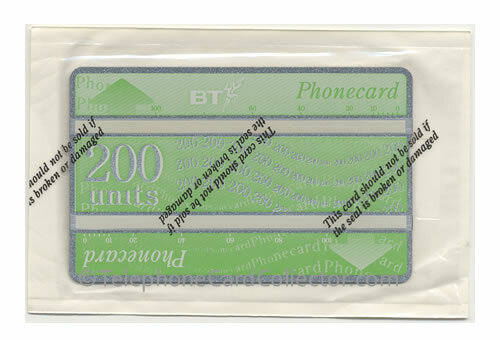 Pictured above - a mint/wrapped 200 unit BT Phonecard containing two separate tracks of 100 unit each. To use, the end user/consumer needed to insert the card both ways... many didn't and just discarded them half used... in other words they threw £10 (worth of phone calls) in the bin! Collecting used or mint phone cards today in 2019 means buying them from individuals, collectors or dealers. Phone Cards are available online, however it is also possible to pick them up at car boot sales. It also worth buying a telephone card catalogue complete with price list, so you know just how common or rare the card you're bidding on is! Pictured right - a used BT Phonecard - burn marks on the cards white track signify that the cards 20 units have all been used. There are also a number of telephone card clubs around the world to help you start collecting. Many of these collectors clubs have their own websites with news, etc and details of their next meet or phonecard fair. Here in the UK the club is called Telephone Card Club of Great Britain. Do you know of an overseas telephone card club or collectors website? Please contact me and let me know, so I can add details of the club/collectors website.